At the end of each course our students have the option of writing a testimonial which you can read below. My experience with Field School has been amazing. They have taught me multiple methods to gather information in such a way that protects the safety not only of myself, but the animal. They help you apply essential fundamentals you will use in the research field. Every skill I have gained from this experience will help further my conservation efforts, and prepare me for my future. I would highly recommend this program to anyone interested in field research. I have had multiple “moments” during the past two courses that have let me know I am in the right place. I will be forever grateful for Field School. They are more than a team, they’re a family. This has honestly been the best experience of my entire life so far. The hands-on experience and knowledge I’ve gained from both courses does not compare to anything I’ve learned in a classroom. Not to mention, all the people (staff and students included) were amazing. Field School staff made this trip incredible, they are the most down to earth people, with an enormous amount of knowledge about the ocean. What an amazing way for me to kick off my career in marine biology. Thank you guys so much for this unforgettable adventure. 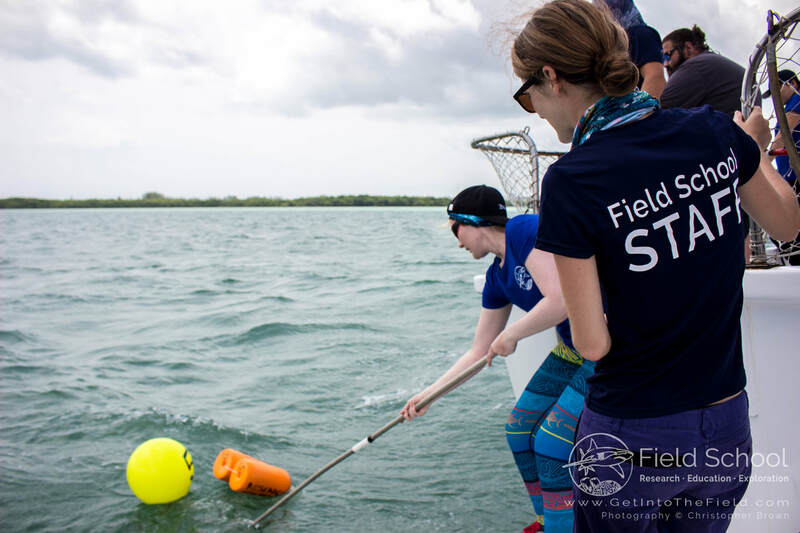 Field School is [enthusiastic expletive] awesome! I have gotten more out of two weeks here than two years at my university. This class has answered so many questions and has given my future grad school plans a direction. I feel super lucky to have found this opportunity. The staff is super helpful and genuinely want to help their students succeed, whatever path they take. I’ve never met anyone else so willing to help prepare students for grad school. This will be far from my last trip on R/V Garvin. 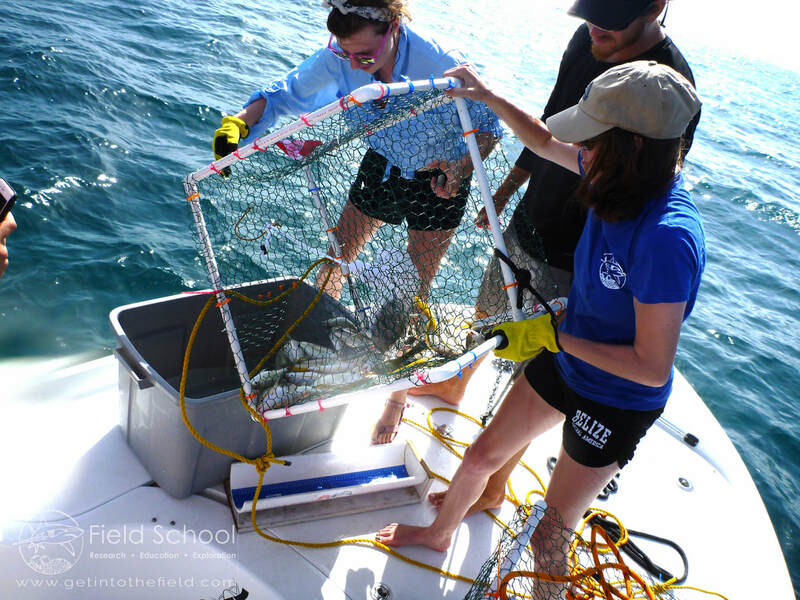 Field School is like summer camp for marine sciences. 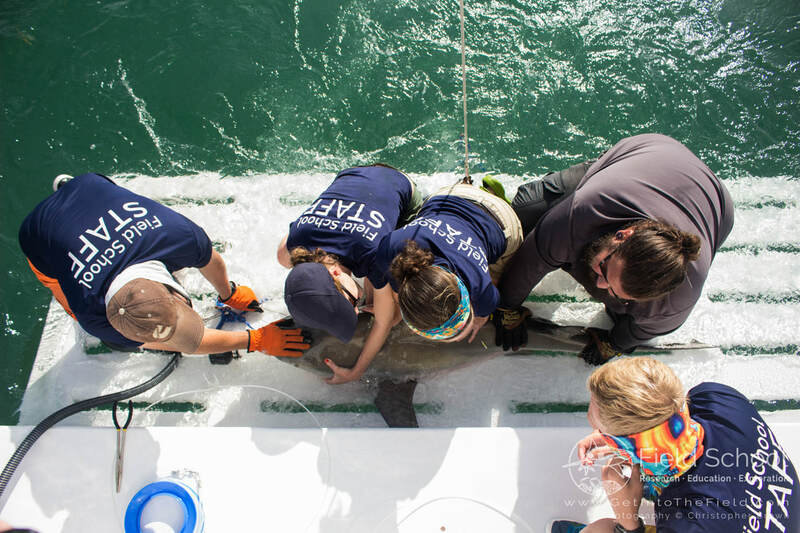 It’s an incredible experience and opportunity to learn, and gain hands-on field research techniques. The staff are knowledgeable, capable, and willing teachers. They are happy to explain anything and everything. The Garvin is a beautiful ship with a very comfortable and homey feel. The food is excellent with fabulous homemade meals and snack foods galore. I’ve learned a lot during this trip and wish it wouldn’t end. I’m an international student and I found those courses: Tropical Marine Ecology and Elasmobranchs are great. I have never been that close to see of handle sharks or freediving. I felt very interesting to find research and teamwork is that trust. We trust each other like work as “A person”. I feel confident of what I learned from the book and when I got here see a fish. I was so excited about it but I couldn’t ID them just by a single peep at the fish. But now I can do that. I love the Field School. These 14 days of my life I will never forget. It benefit more than you think it will be. Leaving this course, I have no doubt in my mind that I’ve been taught by the most knowledgeable, energetic, and professional instructors in the field. Their fierce devotion to ocean conservation and informative, tangible instruction of the next generation is unparalleled. This course will be a defining week in the life of any student, especially those pursuing a scientific career. My advice to students thinking about taking this course: do it. 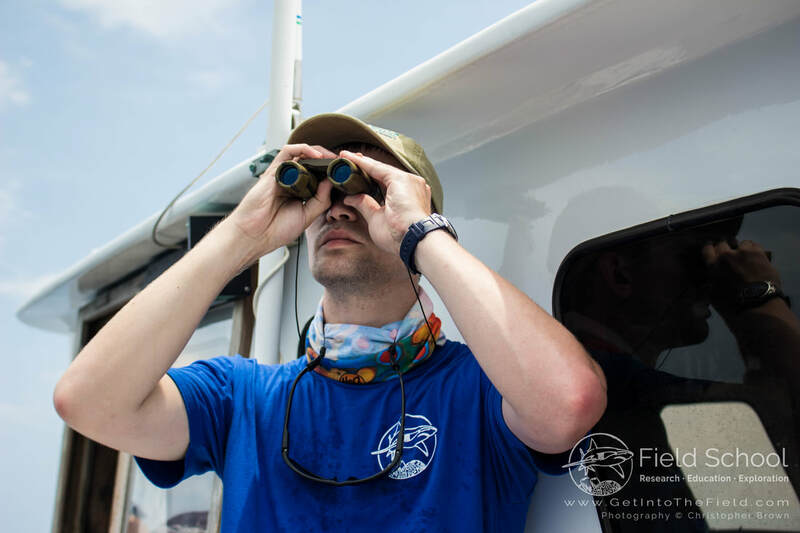 If one week aboard the Garvin does not change the way you think about ocean conservation, your career path, and the fantastically intricate world around you, nothing will. For this course, the sharks are just icing on the cake. I would highly recommend this or any Field School course to anyone looking to gain field skills or to clarify their research and career goals. 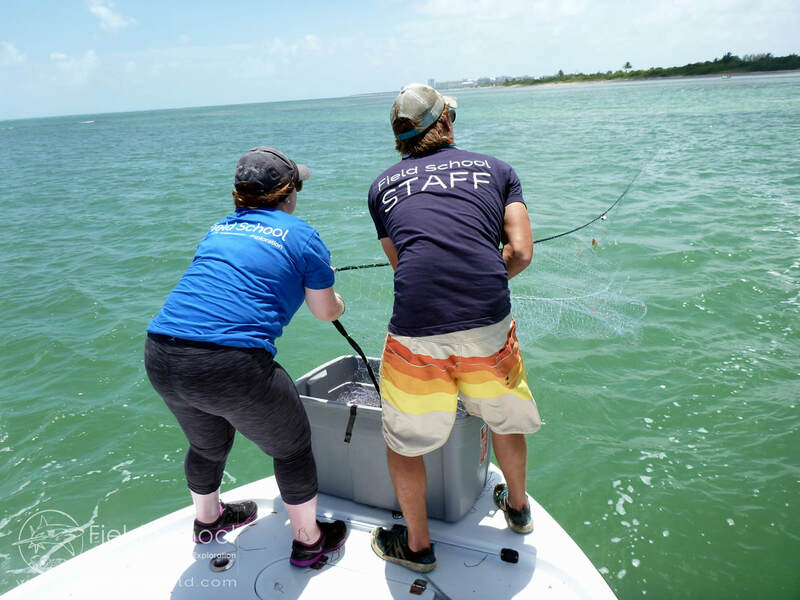 I came in with minimal experience with marine field research and am leaving comfortable with and capable of using drumlines, longlines, and gillnets in research settings. More importantly, I feel comfortable in knowing when to use which technique and how to do so in the safest way to researchers while minimizing the stress on the animal. Instructors prioritize safety while giving plenty of opportunity for skill development and hands-on experience. 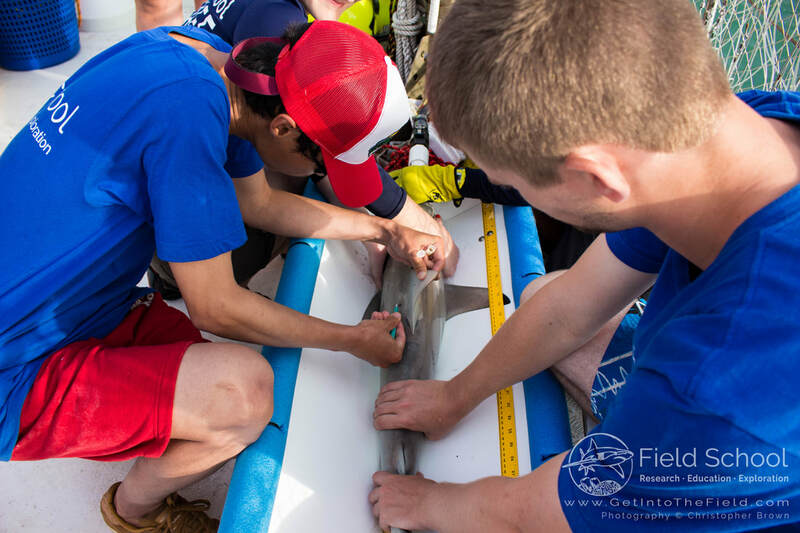 They are all pleasant, fun, competent, and come from such a diverse array of backgrounds that any student with any interest in Elasmobranchs could find common interests and guidance regardless of what their focus is. The atmosphere is fun, the food is incredible, and the RV Garvin is an incredible research platform. The instructors provide invaluable guidance and advice related to each student’s interests. I had an incredible time and have gained so much experience and such an array of skills that will make me so much more marketable in future jobs. This has confirmed my love of being in the field and for the first time has made me consider than perhaps I’d like to conduct my own research. Field School is one of the best experiences I have ever had! 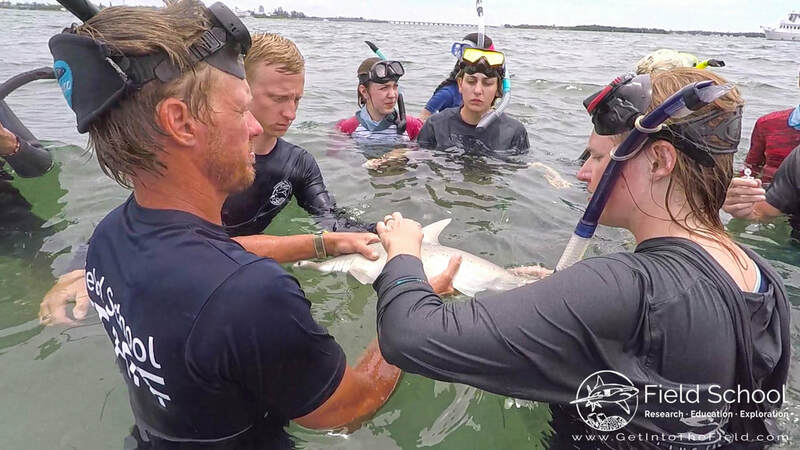 Having the chance to get real hands-on experience with sharks while being taught by brilliant, fun experts is a once in a lifetime opportunity! I am thankful for all the incredible people I got to meet—my fellow students and the entire Field School staff—and for all of the time I got to be surrounded by beautiful sharks. 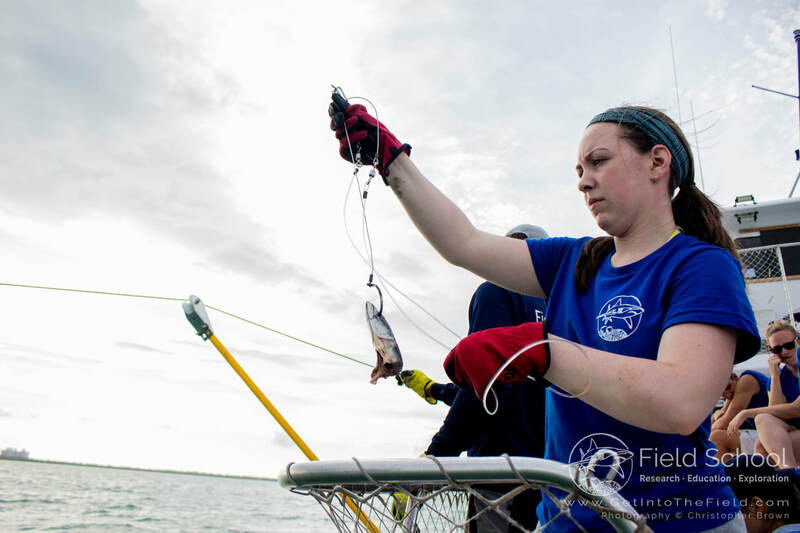 I am coming out of this course feeling ready to begin my own career with sharks and I can’t thank the Field school staff enough for helping me begin my future following the completion of my undergrad degree next year. Where do I even start? This has been, without shadow of a doubt, the most educational, inspirational, and most generous course I’ve ever part-taken in. The staff understand first-hand how difficult it can be to get the assistance you want, and need when working/wanting to work in this industry. They have offered some life-changing advice to every student who has set foot on board the R.V. Garvin over the past two weeks; on both the Tropical Marine Ecology and Biology and Elasmobranch courses (of which I was lucky enough to participate in both). If you are thinking of doing this course but are still uncertain—do it! I feel at a loss for words for how much I’ve gotten out of these courses. Not only that, the staff have ensured that their guidance and help don’t stop as soon as you step off Garvin. 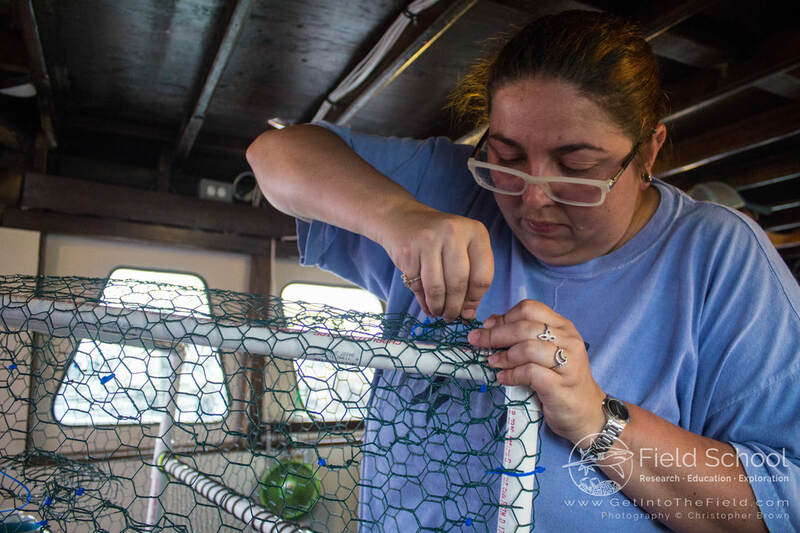 As for the quality of life on board: You won’t find a team that meshes together as well as the Field School staff. The sleeping/living quarters are extremely comfortable with full air-conditioning. They have 4 hot water showers (almost unheard of on a boat!) and access to a laundromat on the dock. The food is also amazing, you won’t be disappointed! I sincerely hope I’ll be able to stay in contact with all of the Field School staff, they may have taking me on as a student, but I feel like I’m leaving with a boat-load (excuse the pun!) of new friends. I’m already planning my next trip back to Garvin, and already I can’t wait to work with Field School again. One of the best and most valuable experiences for anyone considering a future in science! The staff are so welcoming, and make learning new skills easy and fun! Easily one of the best courses I've taken, filled with many adventures and shark encounters! Worth every penny. I can't thank you enough--the crew are unbelievable people, scientists, and teachers! 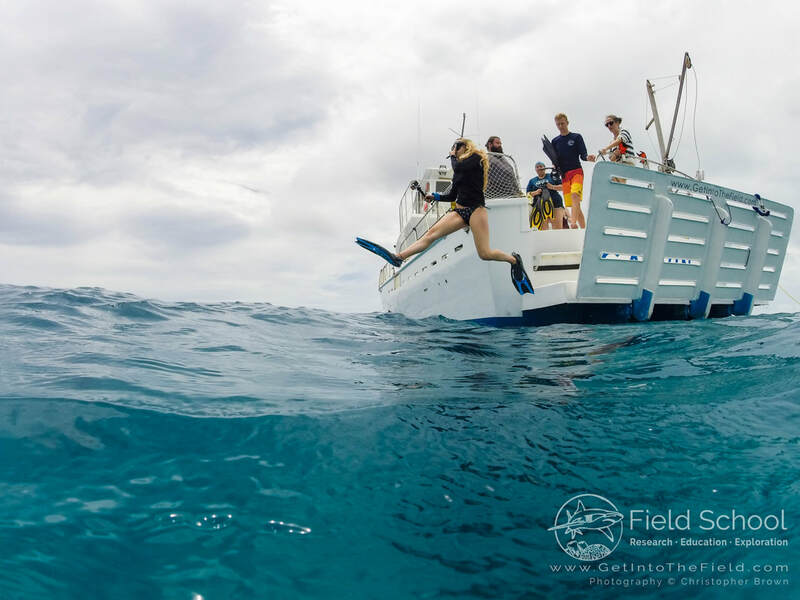 From free diving to seagrass monitoring to shark handling techniques, Field School has given me the opportunity to develop practical and marketable skills for future research and employment. I really enjoyed the balance between lectures, field work, and building and prepping gear. I love the enthusiasm of the crew and the comforts of the R/V Garvin! I will never be able to thank the team at Field school enough. Their support, whether it be teaching me about shark biology and marine conservation, giving me opportunities to improve my public speaking and teaching skills, or mentoring me through all of the tough aspects of my career as a young scientist, has undoubtedly made me who I am today. Catherine, Christian, and Julia have a special enthusiasm and passion in them that makes students eager to learn more. They genuinely care about all of their students, and it shows. Catherine, Christian, and Julia thanks for everything! You guys are the absolute best! The thing about Catherine, Christian, and Julia is that any one of them could hold up a strong educational program on their own. They bring years of experience and expertise. But what really makes them special is their personal approach to mentorship and the fact that, when combining their effort, you don’t just get above average outcomes; you get something far more impressive and impactful. 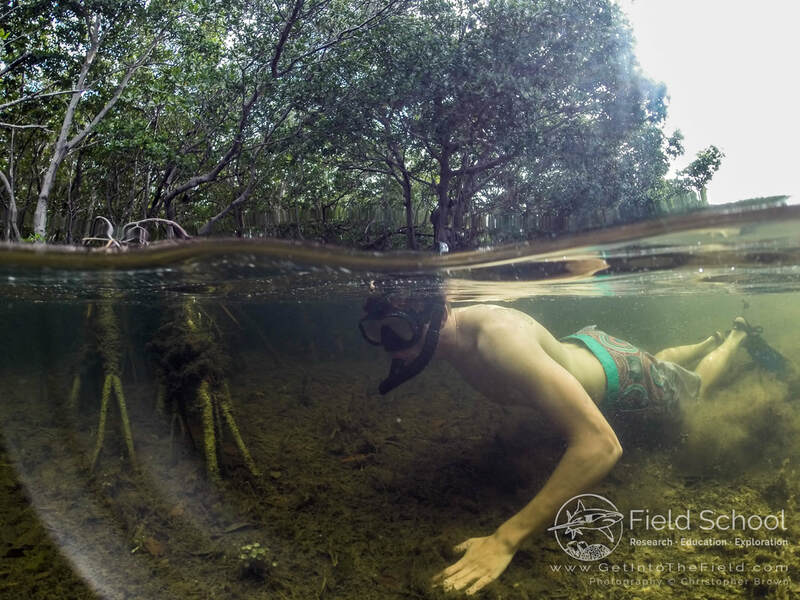 When you’re done training with the Field School team you don’t just walk off confident that you’ll get the job. You are the job and you can stand on your own two feet and tackle work straight out of the gate. As the summer comes to an end, I would just like to say that I am so grateful for the opportunities you have provided me. In such a short amount of time I've learned so much and my passion for sharks has grown far more than expected. Thank you for everything. It was the opportunity of a lifetime! I am so honored to have been a part of this incredible research and this brilliant team, who made me feel welcome from the start. 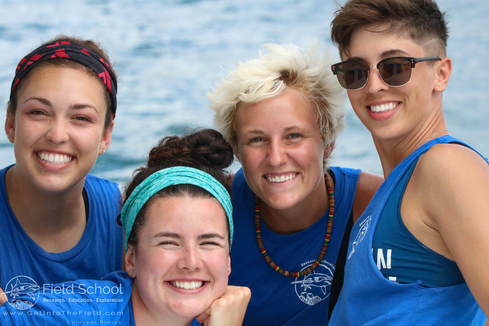 The staff at Field School are caring people that excel as field instructors and mentors. They display expertise in the field they are teaching and spend time continuing to gain new knowledge in their field. They present material in an enthusiastic and engaging manner and instill a hunger in students to discover more on their own. For example, I’ve seen these instructors capture and retain the attention of 20 high school students, all while on a rocking boat in the Florida sun. During my time in university I was fortunate enough to be mentored by Catherine, Christian and Julia. They taught me a whole new set of skills that I would have never been able to learn in the classroom, included but not limited to animal handling, giving talks at schools and learning proper scientific protocol. Thanks to the new skill set I acquired through their mentorship a whole new set of doors have opened to me. "I can honestly say that these are two of the most engaging, exciting and energetic professors I've had during my four years of college. They stimulate interest in the course, and assign reasonable amounts of work that keeps us constantly learning without being overbearing. Both professors are incredibly engaging, and are understanding and easily approachable. I would recommend this course 101 times out of 100." "Catherine and Julia are some of the most engaging and down-to-earth professors I've had, and this was one of the best classes I've ever taken." "I feel my perspective on the value of the ecosystem was completely turned around in a positive way." "This course was among the most well organized and thought through that I have had at University. The biology/social science combo lent itself so well to the topics and the team-taught nature really went well. Topic to topic, lecture to lecture it was very clear that everything was very intentional, something lacking in most classes." "The course content was extremely thought-provoking and required serious, critical analysis to fully grasp. I absolutely loved every topic we went through. I've also gained an unexpected and unprecedented respect for the blue-fin tuna." "You guys are great. Better teachers than professors I've had that have been doing this 20+ years." 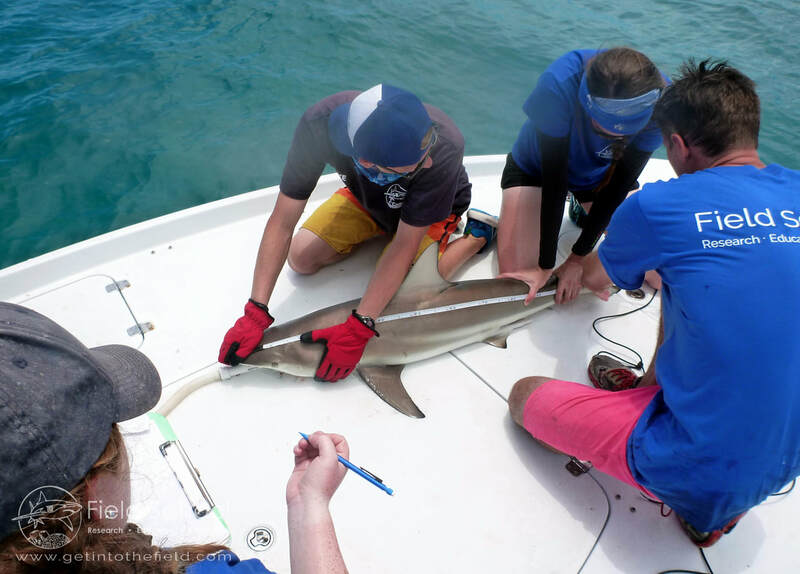 "This was literally my dream course; ever since I was a kid I wanted to take a class that focused on learning everything about the ecology of specific animals. The class was everything I wanted/expected and more. It met my expectation for teaching me ecology, with the added bonus of improving my scientific writing and critical thinking skills." "Honestly, my favorite course I've taken in university." ""I loved the interdisciplinary nature of the course. I had never really thought about just how intertwined an animal's ecology is with the way we interact with and conserve them...In all seriousness, you guys are awesome. You were funny and engaging and great at framing the concepts in ways we could easily understand. Probably two of the best lecturers I've had." "Julia and Catherine are both wonderful professors and people who are very passionate about their topics. Anyone would be lucky to take one of their classes."